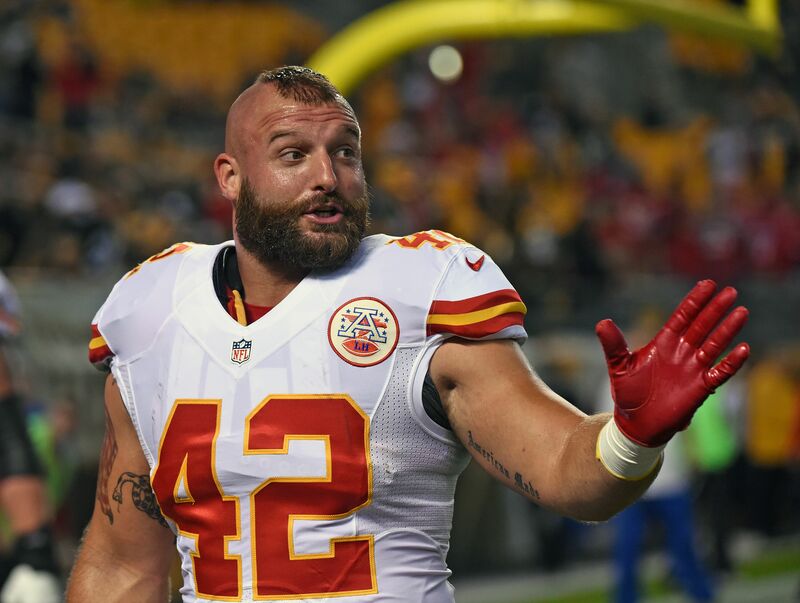 Kansas City Chiefs fullback Anthony Sherman arrives to training camp looking like the living embodiment of #Grit. In 2015, Anthony Sherman showed up to training camp wearing work boots, a homemade pair of jorts and a tight black tank top reading, “COME GET SOME.” In 2016, it was jean overalls. By then the fullback’s preseason attire had become a yearly event. Determined to continue to outdo himself, Sherman arrived on the campus of Western Missouri University on Thursday morning in full-America getup, much to the delight of the Kansas City media. The boots and self-hewn jean shorts are throwbacks, but Sherman went for the frills on his upper body. The custom leather vest is great, but what’s on top is absolute dynamite. Seriously, check out this headband. Has anything ever been more ‘Murica? Sherman’s fashion acumen is a pleasant distraction from some of the less attractive preseason storylines surrounding the Chiefs. There is a fair amount of uncertainty in how things will play out between quarterbacks Alex Smith and Patrick Mahomes, and animal advocacy groups are openly protesting the hire of Michael Vick as a coaching intern. Apart from the obvious humor behind Sherman’s attire, there is also a seriousness to his antics. Sherman was brought up in a blue-collar family and learned early that hard work was the best way to get ahead in life. He uses this opportunity to display that to the public, even if he does have a bit of fun with it. Sherman is expected to be Kansas City’s starting fullback this season. He saw limited playing time in 2016.